This intricate Diamond ring is set in romantic 14 Karat rose gold, featuring three flower-shaped clusters of shimmering bezel set Diamonds intertwined with pave Diamonds with Milgrain trim, like the vines of a rose bush. Treat yourself or that special someone you love with this one of a kind ring. 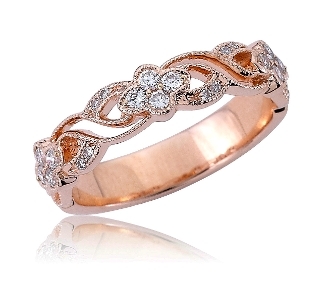 It is a perfect choice for an anniversary gift, wedding band, or simply a right hand ring. For added appeal personalize this ring by choosing our Engrave option, and indicate size needed when adding to cart.